A Review of No Man’s Sky | Random Thoughts - Randocity! This game is getting a lot of flack, particularly for being boring. Let’s explore. In this day and age of Call Of Duty, Destiny, Titanfall, Grand Theft Auto and Skyrim, gamers have become jaded. We, as game players, are used to these huge story driven games. Games that talk (ahem, preach) about some topic near and dear to the developer’s heart. 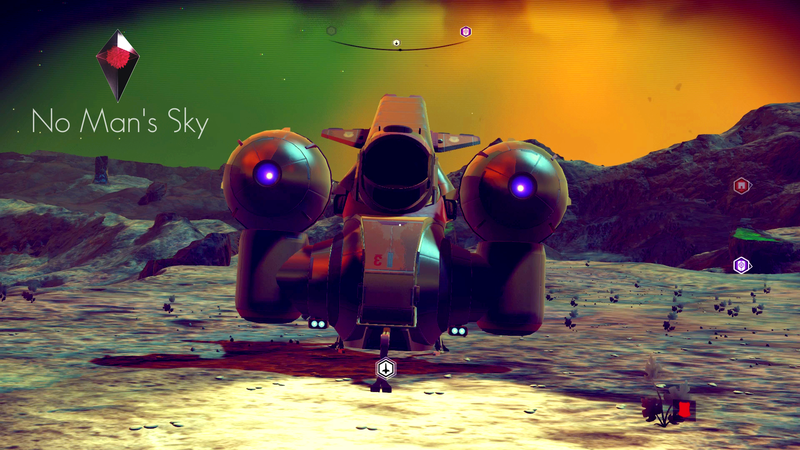 Unfortunately, Hello Games made a critical error in its bid to woo a lot of gamers on-board. Before that, let’s get one thing perfectly clear, No Man’s Sky is an eclectic open world exploration game made on an indie budget. It is not a story driven blockbuster. Trying to woo in the gamers who are used to playing contrived and mostly rail-based story games was the wrong audience to bring. This is an audience that will take one look at this game and call it a “nothing game with no story” and boring. Yes, it’s very slow paced and very VERY open world. Hello Games shouldn’t have tried to shove a round peg into a square hole, though with enough work it can be achieved. Unfortunately, these types of gamers are now posting one star reviews all over Amazon. This was mistake number one. For those gamers who were watching this game’s development very closely since 2014, when those same gamers got their hands onto this game, they were sorely disappointed. What they saw on the demo was an unrealistic contrived world crafted by artists solely for demonstration. It wasn’t the actual in-world gameplay. It was a prototype of what the game might be. Was that a promise to deliver? Did they actually fail to deliver? That’s for you to decide. Personally, I don’t think they under-delivered. I personally think that what they achieved as a small indie developer team is pretty frickin’ awesome. Not only did they manage to get the release out the door (mostly functional), they did achieve most of their objectives with the game. This is a far cry more than I can say for some Kickstarter campaigns. Don’t get me started there. However, there were promises made around space combat that haven’t panned out. All of the space combat I have found has been random encounters, usually based on the fact that I’m carrying too much valuable loot. It’s pretty contrived and the space battles have nothing whatever to do with the overall story, such that it is. Failing to deliver even one promised feature is mistake number two. While No Man’s Sky does offer a get-to-the-center-of-the-universe story arc, that’s really pretty inconsequential compared to how many star systems there are and what you can do and see there. While I will say that the worlds can be somewhat repetitive, the animals are diverse, the flora is diverse (sometimes abundant, sometimes devoid) and the planets can even be hostile, contain water or contain huge cave structures. Unfortunately, far too many of the resources are duplicated throughout each world. For example, the hexagonal iron and the crystalline plutonium structures which are the same on every planet. In other words, some things aren’t procedurally generated. What Hello Games failed in was the open worldness of the entire universe they created. Instead of promoting and touting exactly how much the universe is diverse, they instead focused on the story arc leading to the center. And, they expected gamers would follow suit and also fall in love with that. Unfortunately, how can we? A story starts with characters and in No Man’s Sky, we have none (other than a few sparsely populated aliens sitting or standing in structures). Aliens, I might add, that do not walk, talk (other than in gibberish language), fight or do anything else other than stand there and look pretty. The worlds themselves are devoid of humanoids entirely. The only thing you’ll find on the worlds are animals… and some are a might strange at that. Without a cohesive set of characters, it’s hard to wrap your head around that there is a story. This is mistake number three. This is a catch phrase that makes up for a large amount of the banter around this game. Instead of focusing on the fact that the worlds are crafted in a bunch of code, we need to focus on the lack of story. So many people came to this game thinking that there would be a story. Instead, the story is a loose thread of getting to the center of the galaxy. That’s not a story, that’s a quest. Unfortunately, it is among about 3-4 actually defined quests in this game. For example, learning words of the Aliens seems to be another type of quest. What happens when you finally learn all the words, I don’t know. Is it related to the center-of-the-galaxy story arc? Again, I don’t know. When I get there I might, but I’m not there yet. It’s great that the worlds are crafted entirely in code. But, what I find is that the random hilly landscape of most worlds is tedious to traverse. Worlds should be made up not only of rolling hills, but they should be made up of mesas, deep ravines and all manner of flat plains. It should also be made of of volcanoes, ice and snow and water. Though, I have found a mostly water world that is highly radioactive. Suffice it to say that of all the things that Hello Games got right was the procedurally generated landscapes, even though they can be tough to navigate on foot. Yes. Yes, it does. As with most games of this genre (I’m looking at you Elite II: Frontier), the game starts you out with a small everything: ship, suit, money, inventory, inventory slots, resource, etc. You name it, the game starts you out small… very, very small. To progress, you must have a lot of patience. Some might say, the patience of Job. That is, the patience to wade through the constant recharging of your suit, recharging your power ups, recharging your equipment, recharging your ship, recharging your gun and keeping up all of the things that help keep you alive. On top of that, the game requires you go out and find the resources to keep those recharges going. And, in the beginning, it’s a constant battle for survival. It can take several real hours to level your gear up enough to even dent making No Man’s Sky somewhat bearable. Again, this was a mistake. Most games today offer Easy, Novice, Intermediate and Hard levels. Hello Games should have worked this in. For those who end up on Easy, you can skip all of the constant recharging and jump right into space battles and other types of combat. Better, the game should have offered character classes. Classes that would have allowed for more diverse suits, access to specific types of ships, to let people choose whether to explore, smuggle, trade or what ever profession they chose in this universe. It’s a diverse universe with almost infinite planets. Constraining the player to a single type of personality goes against the diversity of the universe. Adding classes allows for more weapon choices. Instead of just the multi-tool, you could get a real gun, a saber or even add other character enhancements (powers). This would take No Man’s Sky to a whole new level. Unfortunately, Hello Games focused way too much of its effort on the procedural generation and not enough on the game mechanics of what you would actually do on these worlds once there. This is mistake number four. While there is a commerce system in the game, it is naively designed, arbitrary in its creation and what I would call bare-bones-basic. So, while you can sell found resources (gold, plutonium, carbon, emeril, pearls, etc), you cannot sell your ship, sell your weapon or sell certain crafted items. In fact, when you go to the store (which consists of what looks like an ATM), what you can sell is strictly controlled by the store, not by what’s in your inventory. For example, Dynamic Resonators (a key item in crafting pieces of your hyperdrive) are not purchasable or saleable in the store and do not show up when you attempt to sell or buy stuff. Worse off are the ships. While you can buy star ships from various aliens that show up on landing pads, you cannot sell your ship. In fact, if you do buy a ship from an alien, your old ship now becomes abandoned where you left it. You can reclaim it if you want, but then you’ll abandon the other one. This means you cannot own more than one star ship at a time. You also can’t sell your star ship to get money back towards a new sale. This is all the more frustrating because these ships cost a mint (like 4 million units for the smallest decent ship and up to 50 million for a 39 slot job). So, while it’s perfectly fine to go mine for resources (and sell them), you can’t sell your ship or weapons? I don’t think so. This is huge mistake number five. What did they get right? The worlds and the way they look. The stylized futuristic worlds are amazing to behold and stand on (when you’re in the sunlight). When it’s dark, not so much. When you’re in caves, the suit doesn’t have a flashlight. In fact, there is a flashlight, but unfortunately the flashlight is disabled when the sun is up (even if you’re in a cave). Yet another faux pas. So, there’s no easy way to illuminate dark places at times. Thankfully, Hello Games got the bio-luminescence of the plants right to at least illuminate enough of the underground world so that not having a flashlight isn’t so much of a problem. But, having a flashlight available all of the time would definitely help. The multi-t0ol. For being both a weapon and a mining tool, it works quite well against sentinels and animals alike. The tool itself is rather generic, though. Calling it a multi-tool makes me think of a Swiss Army Knife. It doesn’t make me think of a gun. Still, it works well once you have the right power up mods on it. Mining. Looking for and locating resources works very well. Unfortunately, the resources are always too abundant on every world. You can always find plutonium to power your suit and other things. If you end up in a cave, you can usually find lots of plutonium (and other resources). It’s not exactly hard to find the stuff you need, it can sometimes just be time consuming if you find yourself walking around the planets a lot. Exploring. It’s easy to get around the worlds and find new stuff. Selling stuff. It’s easy to find and sell stuff to make credits. It’s practically impossible not to find stuff to sell. Though, you can’t sell animal skins. You can sell resources, but not animals. What they didn’t get right? Space battles. The battles in space are random encounters with random ships. Ships that come in large squads and that usually outstrip your ship’s armament and shields. I’ve learned to simply avoid these battles by landing on a nearby world. Just make sure you stay close enough to a world that you can dive-bomb the world and land. Otherwise, you may be forced to find your grave in space. Graves. When you die, your ship drops all of its cargo, or your suit drops all of its inventory. This is highly frustrating because you’re forced to work your way back to where you died and pick it all up. If it’s in space, you’re likely to run into those ships that began your space battle while trying to pick it up. In-game Commerce. While it’s relatively easy to sell resources, the fact that you can’t sell your star ship or weapon or, indeed, own more than one weapon or star ship leaves a lot to be desired. If anything, the commerce system is so rudimentary that I’m surprised it works at all. Lack of Story. Since there are no characters, it makes it hard to offer a story arc that makes sense and is even worth hearing. Writing stories is hard, I get that. But, there are plenty of story writers you could hire. Lack of Humanoids. Since there is really no story, there’s likewise no characters. So, the game doesn’t need humanoids walking and talking on the worlds. But, not having them there does make for a rather solitary and, dare I say, boring environment. Meeting up and talking to humanoids would at least offer something to do besides scouring for resources… even if the humanoids have nothing to do with the story. Repetition. You end up doing the same things over and over far too many times. While I agree that it’s important to drive the point home about recharging everything, at some point you need to find a suit and ship enhancement that auto-refills everything. Finding this enhancement makes you fully appreciate having done it manually. Hyperspace Star Map. It’s hard to navigate. For those of us who need to invert the Y axis, navigating the hyperspace star map is extremely cumbersome because there is no setting to inverse the camera. Worse, because the stars are not labeled at all, you have no idea which star is which. Instead, you are forced to touch and look at each star to know if you’ve already been there or not. There is no indication (color, shape or any other distinguishing visual characteristic) to know which you’ve already visited (in case you want to go back there or avoid it). Instead, you have to click on it to find out. I give this game a solid 5 out of 10 stars. They got about half correct. The other half is cumbersome, repetitive and annoying. I wanted a solid space adventure and received a lesson in tedium. It’s definitely not game of the year, yet. It needs a whole lot more work for that. But, considering the sheer number of worlds to explore, see and land on, it’s still an amazing achievement for an indie game developer. Is it worth playing? That depends on if you require a story or if you can be satisfied by making up your own as you go. If you work at Hello Games, please read this. Lose the center-of-the-galaxy idea and focus on exploration and making space battles actually fun… and fix that blasted Hyperspace star map to respect an inverted Y axis and add names next to stars already visited. Let’s get to work. Chop Chop.